In this article, I am going to compare a conventional vacuum cleaner without HEPA filter and the Roidmi F8 vacuum cleaner that features a HEPA filter. On both vacuum cleaners the dust bins were almost full of dust. On the picture below we can clearly see the elevated measurements taken by the AirVisual Node. The AirVisual was able to register PM10 concentrations of up to 162μg/m³ and PM2.5 concentrations of up to 81μg/m³ while the air was flowing out of the conventional vacuum cleaner. The HEPA filter from the Roidmi F8 was able to hold the majority of the PM2.5 particles and the AQM was able to register PM10 concentrations of up to 28μg/m³ and PM2.5 concentrations of up to 12μg/m³ while the air was flowing out of the F8 vacuum cleaner. On the graph below we can see with green colour the measurements the AQM took while the F8 was operating, with red colour the conventional vacuum cleaner and blue colour the AQM on top of an air purifier. Full disclosure, I didn’t let the conventional cleaner run for a long time because I got scared by the high concentrations. However, I did the experiment twice and the results were the same. 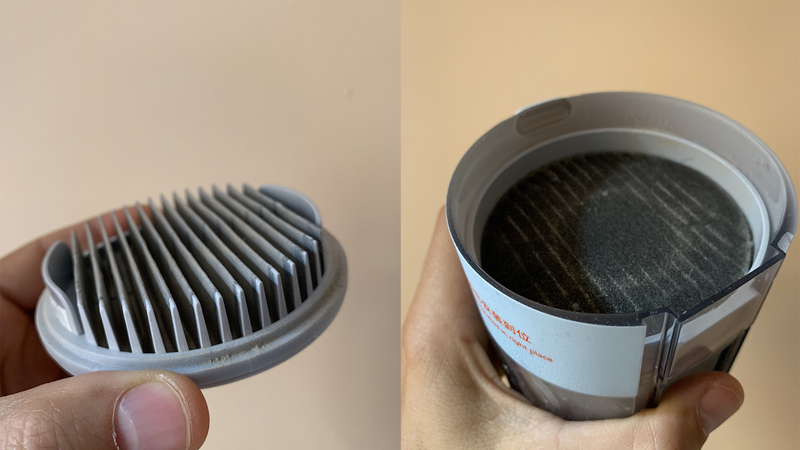 On the picture below, I took a close shot of the HEPA filter (left) and pre-filter (right) after a complete house clean. The pre-filter is able to retain only large particle (hair & dust) and then the HEPA filter retains the PM10 and PM2.5. The Roidmi F8 comes with a mobile app which reminds you when you have to replace the HEPA filter. Roidmi also offers a small bush to brush off the dust that may pass through the pre-filter.